HomeCén fáth Gaelscoil Uí Riada? Togha oideachais ilghnéitheach le buntáiste breise aige/aici cumarsáid a dhéanamh trí Gheailge agus trí Bhéarla. Beidh do pháiste mar bhall de phobal dhátheangach le foireann oilte ghairmiúil ag comhoibriú le tuismitheoirí i dtimpeallacht dhearfach foghlama. Cabhróidh an tumoideachas trí Ghaeilge agus le cumas Béarla agus tríú teanga a fhoghlaim. Scoil nua aimseartha le háiseanna den scoth – áiseanna teicneolaíochta, halla spóirt agus dhá chlós lasmuigh le neart spáis do na leanaí. 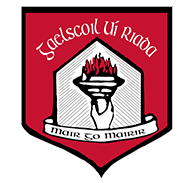 Cintionn an Bord Bainistiochta go mbeidh forbairt pleanálta ag an scoil chun gur feidir le Gaelscoil Ui Riada freastal ar gach paiste agus gach clann agus pobal gaelach a chothú chomh maith.